We’d love your help. 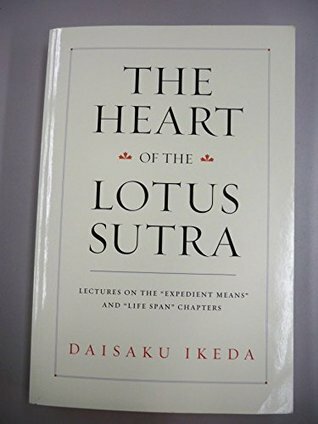 Let us know what’s wrong with this preview of The Heart of the Lotus Sutra by Daisaku Ikeda. The Lotus Sutra has been regarded for centuries as one of the most important teachings in Mahayana Buddhism. This book goes beyond theory to show how to bring these teachings into practice in daily life. Containing profound truths for all people from every culture, it reveals the secret for attaining happiness for both oneself and others through the process of self-reforma The Lotus Sutra has been regarded for centuries as one of the most important teachings in Mahayana Buddhism. This book goes beyond theory to show how to bring these teachings into practice in daily life. Containing profound truths for all people from every culture, it reveals the secret for attaining happiness for both oneself and others through the process of self-reformation. Based on the teachings of Nichiren, a 13th-century Buddhist teacher and reformer, the scriptures of the Lotus Sutra show how every person can attain Buddhahood. To ask other readers questions about The Heart of the Lotus Sutra, please sign up. This was a great book. I have been practicing Nichiren Buddhism for over a year now and learned an immense amount from this reading. I would recommend this to other Nichiren Buddhism practitioners because the things I learned in this book, are things not known by many. While everyone is different, to me chanting is just part of the picture. I want to truly understand the backbone behind the religion I follow. This book helped me to do that. 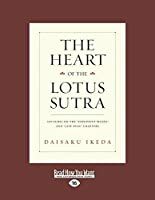 This has helped me to understand the Lotus Sutra better, as, Daisaku Ikeda has written about the "Expedient Means" and "Life Span" chapters, translated them and explained what they each mean and how they affect those off us who adhere to the Buddha's last sutra, which was the Lotus Sutra. 4I absolutely love this lecture on gongyo. I woul suggest that anyone that wishes to add to their knowledge of Nichiren Buddhism read this volume. Life changing experience! Ikeda is the Daisaku Ikeda is a Buddhist philosopher, peacebuilder, educator, author and poet. He is the third president of the Soka Gakkai lay Buddhist organization and the founding president of the Soka Gakkai International (SGI), which is today one of the world's largest and most diverse lay Buddhist organizations, promoting a philosophy of character development and social engagement for peace. Ikeda is the founder of the Soka (value-creation) schools, a nondenominational school system based on an ideal of fostering each student's unique creative potential and cultivating an ethic of peace, social contribution and global consciousness. The school system runs from kindergarten through graduate study and includes a university in Tokyo, Japan, and another in California, U.S.A.
Ikeda is a staunch proponent of dialogue as the foundation of peace. Since the 1970s he has pursued dialogue with a wide range of individuals around the world in political, cultural, educational and academic fields. Over 50 of these have been published in book form, with people such as Mikhail Gorbachev, Elise Boulding, Joseph Rotblat and André Malraux. In furtherance of his vision of fostering dialogue and solidarity for peace, Ikeda has founded a number of independent, nonprofit research institutes that develop cross-cultural, interdisciplinary collaboration on diverse issues: the Boston Research Center for the 21st Century, the Toda Institute for Global Peace and Policy Research and the Institute of Oriental Philosophy. The Min-On Concert Association and the Tokyo Fuji Art Museum promote mutual understanding and friendship between different national cultures through the arts.